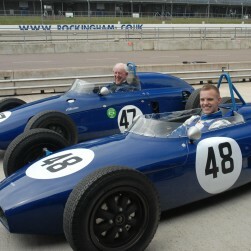 It was an historic day at Rockingham when Callum MacLeod sat on the Formula Junior grid on July 18th. 2009 in Richard Utley's MKII Caravelle alongside Richard himself in the Mk1 version. 48 years after the delightful MKII Caravelle last started a race, at Brands Hatch on Easter Monday 1961, Callum qualified it 6th. on the grid and fastest in class [for rear engined/drum braked cars] despite only completeing two laps in practice! On that fateful Easter Monday 48 years ago, Richard Utley suffered a massive crash which hospitalised him for a considerable time, and wrecked the Caravelle on it's debut. Now fully rebuilt, and race prepared by Speedsport it will, hopefully, become a regular sight alongside Richard's earlier MKI machine at Formula Junior races throughout Europe. Unfortunately Callum suffered further engine dramas in the race and had to retire the car from a good fifth place overall, but it will be appearing again at the Silverstone Classic on July 25/26 with Richard driving and at the Oulton park Gold Cup meeting with Callum at the wheel.